With Valentine's Day around the corner, gardeners of all stripes can find something to love about the Rosaceae family. Those filling their holiday shopping lists with bare root fruit trees should be sure to check the hotline tips about varieties that will perform well even with our less than cold winter nights. Visit a local venue that is open to the public specializing in roses. Learn the basics of pruning to keep your roses and their edible relatives productive. Incorporate pest management tips to keep thrips off the buds and mosquitoes off your ankles. On the days when rain keeps you indoors, learn how protecting the storm drains protects our oceans. While the worms in the garden may not be thrilled about drizzle, those in your new vermicompost bin can continue to do their part in diverting kitchen scraps from the landfill and increasing your soil fertility no matter the weather. 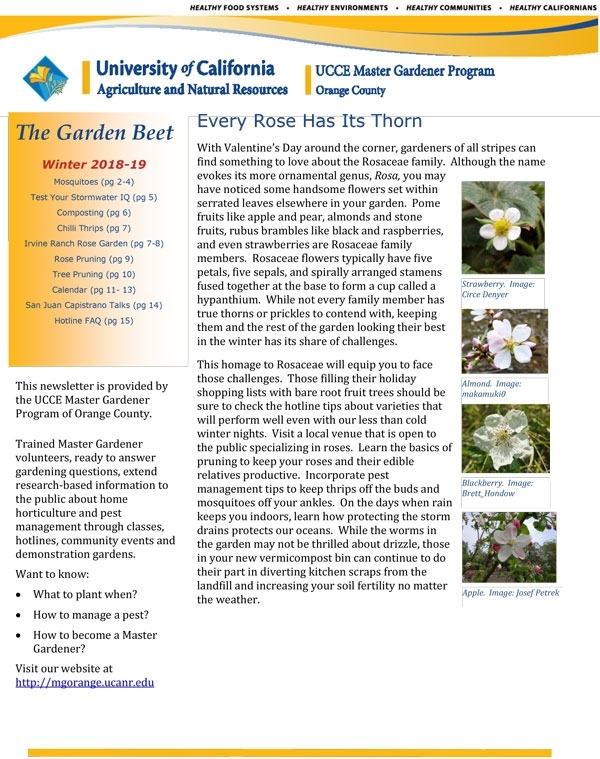 Don't forget to visit our website at http://mgorange.ucanr.edu for past issues of the Garden Beet and more detailed information for your gardening needs.